Welcome to the Septic Checker Reseller Signup Page. Please only fill out this form (page bottom) if you would like to sign up as a reseller, and receive special reseller pricing. 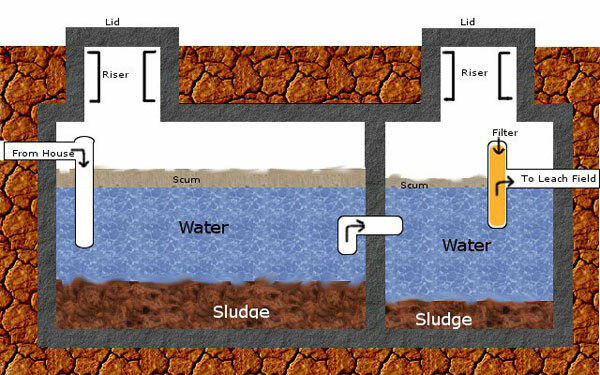 Septic tanks break down biodegradable solids, and allow the water to flow into the leach field. Over time, sludge develops on the bottom of the tank, and needs to be pumped out. Knowing when to pump your tank is the tricky part. How often to pump a septic tank depends on many things, such as the size of the tank, the size of the household, and what is put into the tank. With the Septic Checker, you can easily take a cross-section sample from the septic tank and view how much sludge, water and scum are present. If you are approaching, or over 30% sludge + scum, it's time to have your tank professionally pumped. By checking this yourself periodically, you will save money since you won't need to pump as often, and you can ensure you don't wait too long which can cause severe damage to your septic system. With the Septic Checker, all you have to do is remove it from its carrying case, screw the pieces together with the built-in unions, remove the cover off of the septic tank, and slowly extend the Septic Checker into the primary tank (inlet/house side). When you reach the bottom, you just pull the Septic Checker up about an inch, and pull on the cord until it is taught, and while keeping it taught, wrap the cord around the built-in cleat. This will pull the stopper to the end of the clear PVC pipe, which has been milled to perfectly fit the stopper, and keep it in place. The stopper floats which keeps it up and out of the way until you are ready to use it. Next, you simply pull the Septic Checker straight up, and view the cross-section sample of your septic tank. Not only does the milled end of the pipe provide an excellent water tight seal with the stopper, it is also shaped to cut easily through the sludge layer without disturbing it. The Septic Checker is marked in 1 foot increments, so you can easily see how much sludge, water and scum you have. If you have near, or over 30% sludge + scum, it's time to have your tank pumped. The Septic Checker, including the cord, is impervious to the septic contents, so it is very easy to clean when you are done with a garden hose. 1 inch clear PVC pipe. Large to prevent getting clogged. Milled end to both perfectly seal with the stopper and easily cut through the sludge. High quality carrying case with metal handle. Carrying case has holes in the bottom for drying. 1 foot sections marked for easy measurements. Built-in cleat to hold cord when using. Lifetime warranty against workmanship or defects. Please fill out the following information to sign up as a reseller of the Septic Checker.